I weighed in today, and I lost 1.4 pounds. I was a bit disappointed because I worked so hard the week prior, but I didn’t eat much over the weekend. And I didn’t work out (because I’m sick..have you heard? hehe) So I really shouldn’t be disappointed about losing 1.4 pounds. 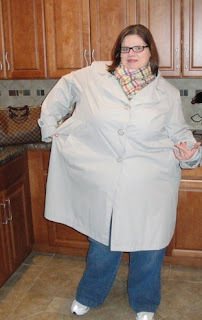 And to cheer myself up, I decided to revisit some of the coats that didn’t fit before. I took pictures of my progress a few months ago when they did fit, but I thought I’d do it again because they’re even bigger now. Yay. 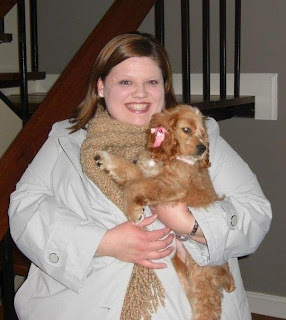 If you ever need to feel excited about your weight loss then look back at pictures from before you started. It will work..believe me. 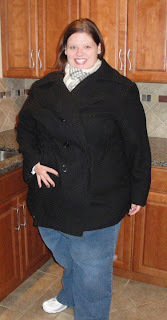 I posted before pics and current pics in October too (in the same coats.) Click here to see the progress I had made by October. And this is a bonus coat. 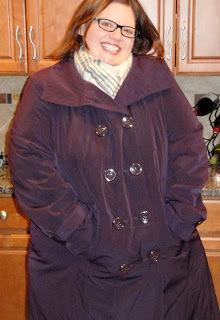 I bought this trench (on super sale) in January, and I couldn’t button the bottom button. Now, as you can see, I can button it though it’s still a little too tight. Now, after seeing these differences I don’t feel so bad about not losing as much as I’d hoped this week. I’ve lost 86 pounds. And I’m going to keep losing…keep getting healthier…and keep being proud myself for the little accomplishments that add up to big ones. The tortoise won the race…and he did it by putting one step in front of the other until he found himself at the finish line. So I’m proud of my losses (even on weeks in which I thought they’d be bigger) because they add up which is most important in the big picture. How do you track your progress? Is it harder for you to see it even when others do? Woo hoo! That's great news. Even if you hoped for more, I am glad you recognize that 1.4 pounds is still a great success and will be followed by much more success in the future. Your pics are amazing, what great evidence of all your hard work!Love the new bag too! I'm at a plateau, 2 weeks without losing, so 1.4 pounds would be extremely welcome to me! Everything is relative, be happy with your loss! I think 1.4 is amazing. I would be thrilled to lose that in one week, especially when you're sick! way to go! I think 1.4 is great! You are right about the tortoise. Another way to look at it – lifetime weight loss is a marathon, not a sprint. I also measure once a month to help myself track progress. The 1.4 lb. loss is great! Plus, the way you can track your success with your clothes. Sometimes we get so caught up with the number on the scale, that we forget that there are other signs of progress. Keep your great outlook, and you will continue to be an inspiration to all of us! PS. I used to have ear infections all the time as a child. The doctor said I would outgrow them, and I guess I did. However, my mother would never let my ears feel the wind in the winter! I always had a hat pulled down over them. At night now, we have a ceiling fan on, and I cannot sleep without pulling the covers over the ear that is facing the fan! Before & after pics are amazing for motivation!! I posted some and I had no idea the affect they would have on me. You look fab and love the coats. 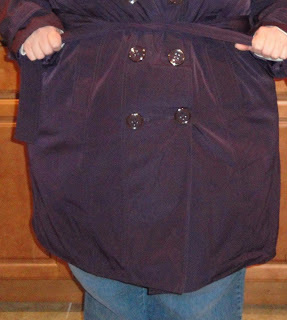 The coats are a great visual for the progress you've made. Also, it's so easy, when you're sick, to let yourself have the week 'off' so 1.4 is awesome! Wow, Wow,Wow! I love that you are taking progress pics! You look amazing! Wow, you are looking amazing! You should be so proud of how far you've come – and I can tell you are. A 1.4 lb loss is still a loss and it's going to keep on going. WOW. I can really tell a difference in the second picture. Good job! Don't beat yourself up over a 1 lbs loss. You were sick, remember?! Congrats!!! That is amazing. I think the pounds are not as important as how your clothes fit and feel. Keep up the good work!